angry chicken: not a tooth breaker, I swear. not a tooth breaker, I swear. I am not on my A-game this week. I have made a coffee cake forgetting 3 cups of flour (Oops. I threw it back in the mixing bowl and added the flour when I noticed the batter seemed to be the consistency of water, and no one was the wiser, thank god.) and then I botched a half-batch of gingerbread cookies today (forgot salt and was crazy/metal with the oven timer. Curses. I blame my new kitchen.) 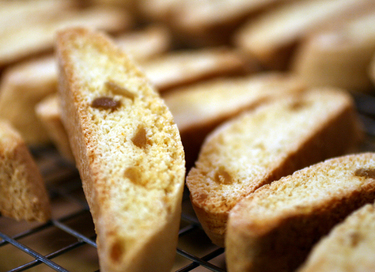 However, I did successfully make this candied ginger orange biscotti last week and it turned out great. Better than great. I changed the mix-ins but it's based off of this lemon anise recipe. So, I think I will be making more of these. Hopefully no recipients will chip a tooth, which has actually happened before. Not with my cookies, but I think with my fudge. I know that sounds really bad. We got our Christmas tree at Loch Lolly this weekend with my brother (toting an amazing pocket chainsaw!) and Grammie. It was really fun and we magically missed the rain. 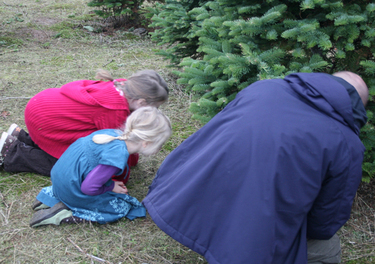 Here's my husband-woodsman cutting down the tree with the pocket chainsaw and the impervious-to cold little helpers. They have a very strong jacket aversion. (It covers up their outfits, which is lame, they tell me.) The tree is up and decorated and hasn't fallen yet. Woot! 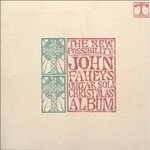 During tree activities we put on a little of John Fahey's Guitar Soli Christmas Album and it felt nice and cozy. And how rad is this cover art? Rad. Thank you so much for all your very informative comments on the last post. So, I will say yes to adding the moonshine to the homemade vanilla extract and adding a vitamin D supplement to my body. It's good to have a plan. Also, for you bloglines folks, I have a new holiday banner up.